Choosing the right exterior remodeling products just got easier with Universal Windows Direct. Find quality replacement windows, vinyl home siding, replacement entry doors, and roof replacement at prices nearly any homeowner can afford. Make your home more beautiful, increase property value, and improve energy efficiency of your Avon Lake, Ohio home. 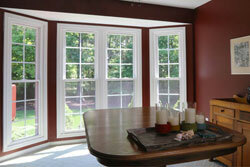 Replacement windows from UWD enhance homes on many levels, from aesthetics to energy efficiency. UniShield® window products, featuring Super Spacer and our high performance glass packages, can save homeowners over $400 per year on their heating and cooling costs. The glass packages, with performance guaranteed through the True Lifetime warranty, improve energy savings with industry-leading technologies. UniShield® is available in four tiers of energy efficient design to meet your needs as a homeowner. For example, UniShield® Plus includes dual pane glass, argon gas, and one application of low-e glazing. This window replacement product is a tremendous value for homeowners who need an affordable yet dependable upgrade. Certified by Energy Star, the comfort levels of your home is improved with UniShield® and professional window installation. UWD takes customer experience to a new level with quality window installation. Every step of the process is explained to the homeowner with a final walkthrough to ensure complete customer satisfaction. Our True Lifetime window warranty ensures that your new windows perform their best for years to come while providing value and comfort. UniShield® is aesthetically flexible and custom made to fit the look of the home and your wants as a homeowner. Popular window styles include double hung, bay and bow, garden, crank out, and picture windows. These window products increase natural light in the home and expand views of the outdoors. Picture windows are availabile in specialty shapes such as octagon, trapezoid, or arch, as well as completely custom window shapes. 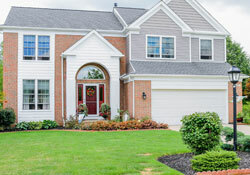 Choosing additional aesthetic upgrades adds interest and flair to curb appeal. Durable vinyl window frames are available in exterior paint colors including red, green, beige, and more. Add decorative glass options such as prairie, double prairie, and etched glass including floral and elongated floral. Obscure glass is available to increase privacy in standard, glue chip, and rain glass. Replacement vinyl windows from UWD are high-quality, high-performance and just right for Avon Lake homes. For total protection and complete confidence, choose Owens Corning roofing system from UWD. Owens Corning is a top roofing manufacturer who engineers premium roof systems backed by a 10-year workmanship limited warranty. Also included is a Preferred Protection Roofing System Limited Warranty, which offers an additional 15-50 years of protection through TruPROtection. Your new roof begins with high quality and durable asphalt shingles. Owens Corning shingles provide impressive contrast along with great dimension to the roof. The roofing shingles are availble in a wide variety of color and profiles to compliment or enhance your home. The shingles stay in place with SureNail technology, adding strength and durability into every shingle. This is a unique design that offers outstanding grip power with Tru-Bond sealant, providing wind resistance of up to 130 MPH. Protect your home from water and ice with WeatherLock G—a self-sealing ice and water barrier. It helps protect against the elements and keep the attic space dry. The roofing system also encourages ventilation with VentSure InFlow, designed to protect against wind-driven rain. This roof component features a clean profile and is installed at the eave or mid-roof. Roofing installation from UWD is a seamless project that keeps homeowners informed step-by-step. The install project is typically completed in a couple days as long as weather permits. A final walkthrough is also completed to ensure your satisfaction. 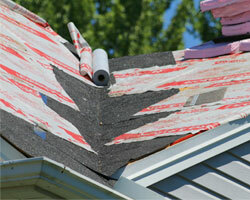 Subpar roofing products can hinder the performance and comfort of the home. Choose UWD for your next roofing project. "Everything went great from contract thru install "
"Installation crew and all involved from start to finish did a great job"
Replacement entry doors from UWD feature innovative fiberglass technology to enhance the security and aesthetics of Avon Lake homes. The exterior doors are engineered with composite stiles that are highly waterproof and defend against every raindrop. The reinforced skins are key to providing exceptional beauty, and an array of wood stain and paint colors are available. To maintain the look of real wood on fiberglass entry doors, choose from one of our available wood grain options. They provide the look of real wood without the timely maintenance and upkeep. 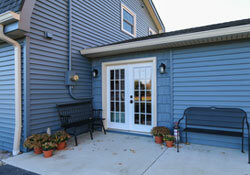 Homeowners can also order entry doors primed and apply your own paint or stain. Steel doors are also available with a variety of aesthetic and energy saving features. Various sidelite and glass combinations are available with a new entry door. This includes internal grids in flat or contour, along with privacy and decorative glass options. Choose your ideal glass shape and style from dozens of options in our inventory. Entry door installation from UWD enhances performance with a weathertight seal. A polyurethane foam core is included for energy efficiency, and the entry door is backed by our True Lifetime warranty. Find the door you adore from UWD. Gain total confidence with the installation of UniShield® replacement siding from UWD. This premium siding showcases innovative technology using the highest quality heavy gauge materials. The exterior is easy to maintain and is guaranteed not to sag, warp, or bow. Your new home siding is installed with expert precision by the trained professionals at UWD, giving it the real look-of-wood appearance down to the authentic wood grain pattern. UniShield® vinyl siding is an affordable luxury. Choose from nearly a dozen colors to enhance your home's current look or make a bold new statement. Additional upgrades include vinyl scallops, vinyl cedar shakes, and soffit to elegantly conceal exposed rafter beams. This siding is strikingly attractive, insulated, and improves home value. It’s protected under UWD’s True Lifetime protection warranty, giving you peace of mind that your investment will be protected for the life of your home. Find the right exterior siding product for your Avon Lake home with UWD vinyl home siding.